How is your weekend going so far? For me, boring. I haven’t done too much but today were celebrating little Jenny’s 20th birthday so were going to a Hibachi Grill for dinner, yum and I haven’t decided what we’ll do during the day. Remember being 20? Oh so young and innocent with a whole world ahead of you. Speaking of being young, I decided to make a kids treat that is good for kids of all ages and that included adults. This little treat brings out the kids in all of us! Yup you guessed it it’s Peanut Butter Cheerios! You knew this had to be coming when I posted the box of cereal the other day! I am so addicted to this cereal. I put it in my yogurt everyday and I eat it by the handfuls everyday. I love it! I like to look at them as little hugs. You know X’s and O’s. I told my Husband I am giving him a tray of hugs to take to work with him. There just so cute! He took them to work and said everyone loved them and they all got eaten! yah!! A lot of time’s he’ll bring some of the left overs back, but he said none on this batch, everyone ate them first thing in the morning. Doesn’t it make you feel good when people like what you made? 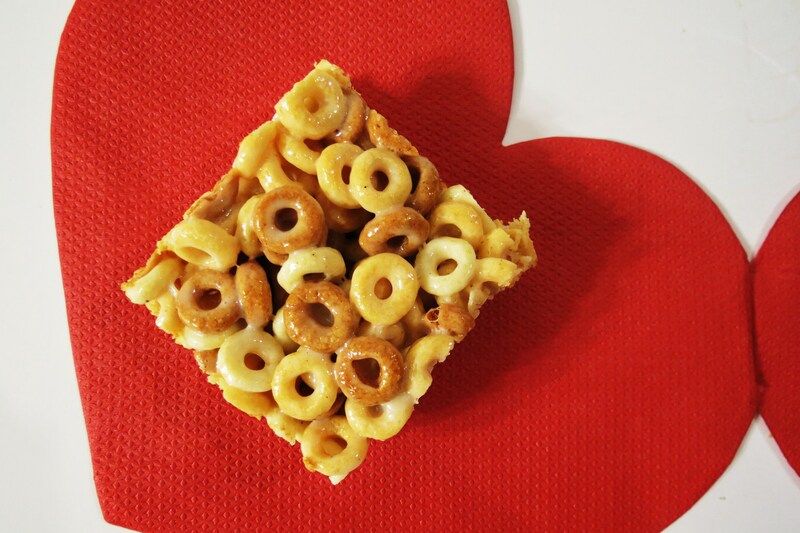 Even as simple and easy as Cheerio treats? 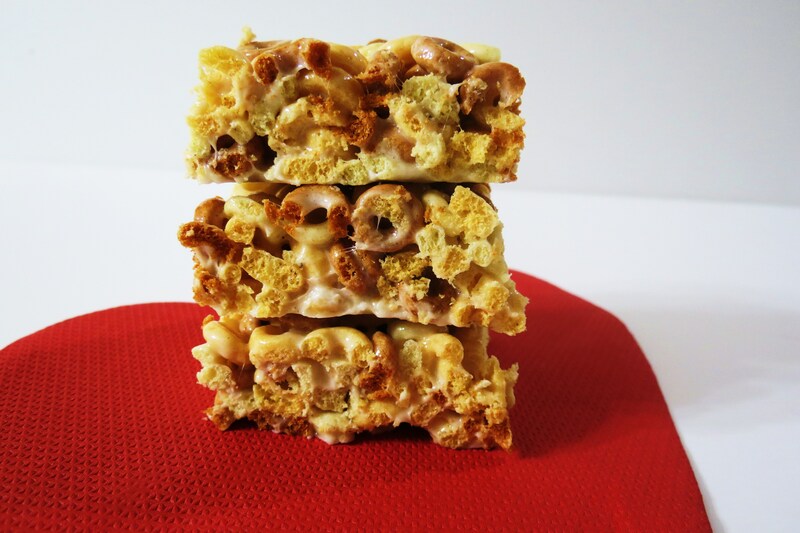 I made these the same way as I did regular Rice Krispie treats. However you could add 1/2 cup of peanut butter to give it more of a peanut butter flavor, but I opted out on it, because it saved me about 25 calories, per piece and when I made these I ate two right off the bat. They are to dangerous for me, that’s why they went work with Hubby, to good to keep around my house. I could easily eat half a pan. I have no self-control when it comes to sweets, especially the sweets that taste like peanut butter. I need serious help, I really do!! 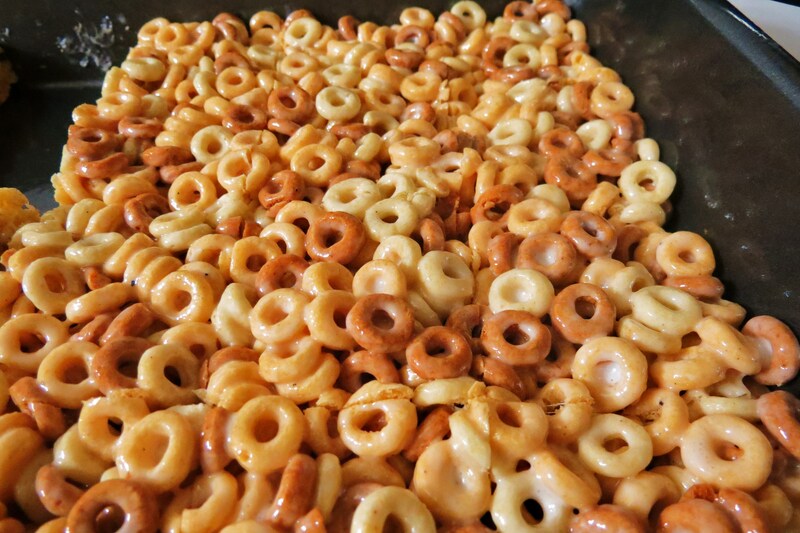 Add Cheerios to the melted marshmallows, and stir until completely combined (you will need muscles here). Press into the pan using wax paper. You could serve these treats for the Super Bowl too!! They will definitely get gobbled up! Not to mention it will take you about 10 minutes to put together! If your still looking for other ideas on what to make check out my post from yesterday. It’s 21 of my favorite treats, snacks and appetizers that I think will be good for a Super Bowl party! Here’s bite mark number 2 on my treat! So darn good!!! I saved some for Jenny, and she has four left in the cupboard do you think she’ll notice if one or two are missing? Well my friends, time to relax for the rest of my Friday and maybe do some stretching. My body is stiff from sitting all day and I didn’t exercise today, so tomorrow morning I need to burn it up or I won’t meet my weekly goal! Have a great day! 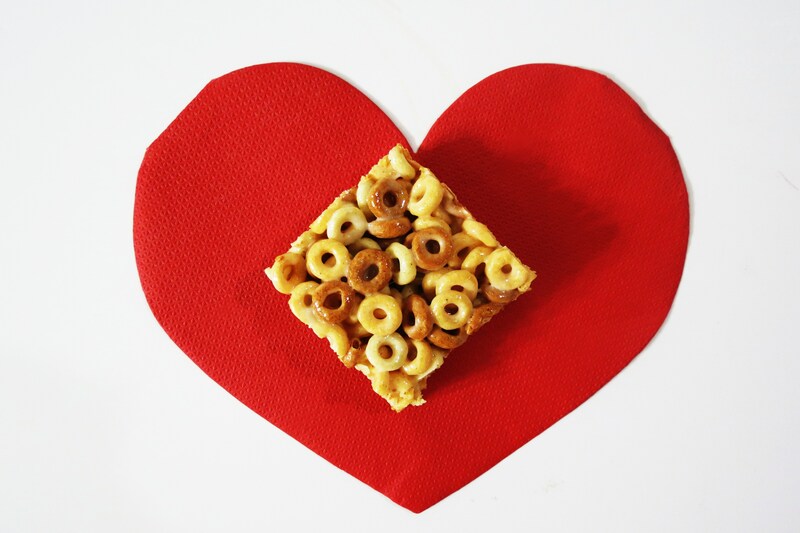 Remember to give some Cheerio Treats to loved ones and tell them there a bunch of hugs held together with your sweetness! Who could resist that? 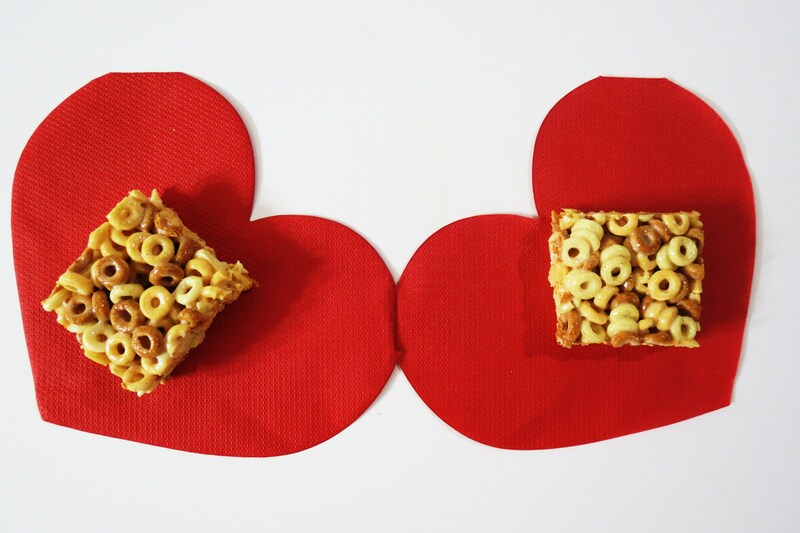 I still need to get my hands on the PB cheerios and this makes me want them even more! I can’t believe you haven’t found them yet, I should just send you a box. There on sale at Target right now. Hello there! I just discovered your blog– I think from a comment on Two Peas and their pod? But now I can’t remember. Anyway, I love it! I am also 30 something and living with one bad dog (I have no idea what we’d do with TWO)! So I feel your pain/joy on that one. I am really looking forward to reading more of your posts–they seem great! Have a good weekend–take care! Yes, we started out with one bad dog and figured if we get another it will calm her down and it did, but he makes up for it. My little Sampson is definitely a bad dog!! Glad you found me, stop back again! have a wonderful weekend!! Peanut Butter Cheerios?? I didn’t even know they made those!! Awe.some. Find them! You will love them, if your a peanut butter fan!! I love that you called these a tray full of hugs. What a cute idea. The pb cheerios sound wonderful. I have not seen them in my stores. I will have to keep an eye out for them because I think they’d be a huge hit. If you find them beware! They are addicting, and I was never a cheerios person and I can’t stop eating them. There not super sweet which I like but I get the peanut butter flavor which I love!! 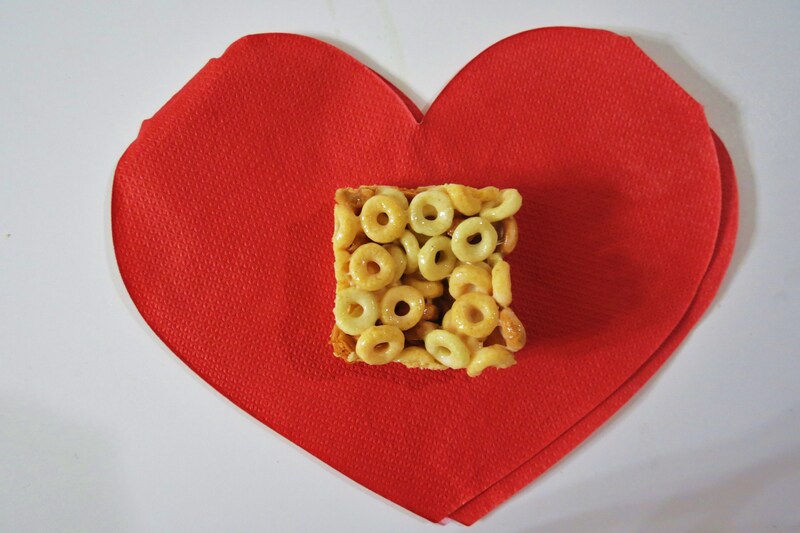 Those Cherrios are seriously the best. I cannot believe they didnn’t make them sooner! I know me either! I bought 3 boxes in two weeks! I put those dam things on everything!! 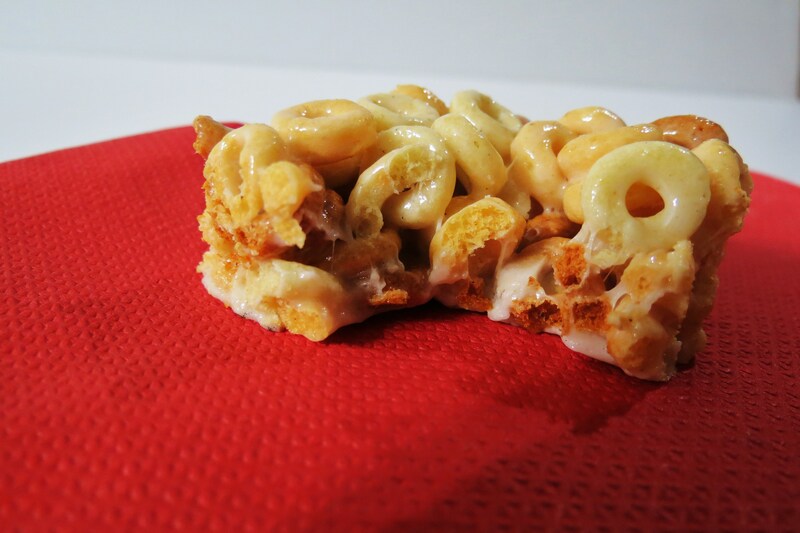 I made these with chocolate cheerios instead, delicious! I bet Chocolate Cheerios tasted delish! !